Malcolm Chun is from the island of Oahu and moved to Hilo, Hawaii in 2014 after retiring from the Hawaii Air National Guard. He is pursuing his degree in Electronics Technology from Hawaii Community College, where he will earn his Associate in Applied Science. After graduation, he wants to pursue a career in telescope instrumentation. 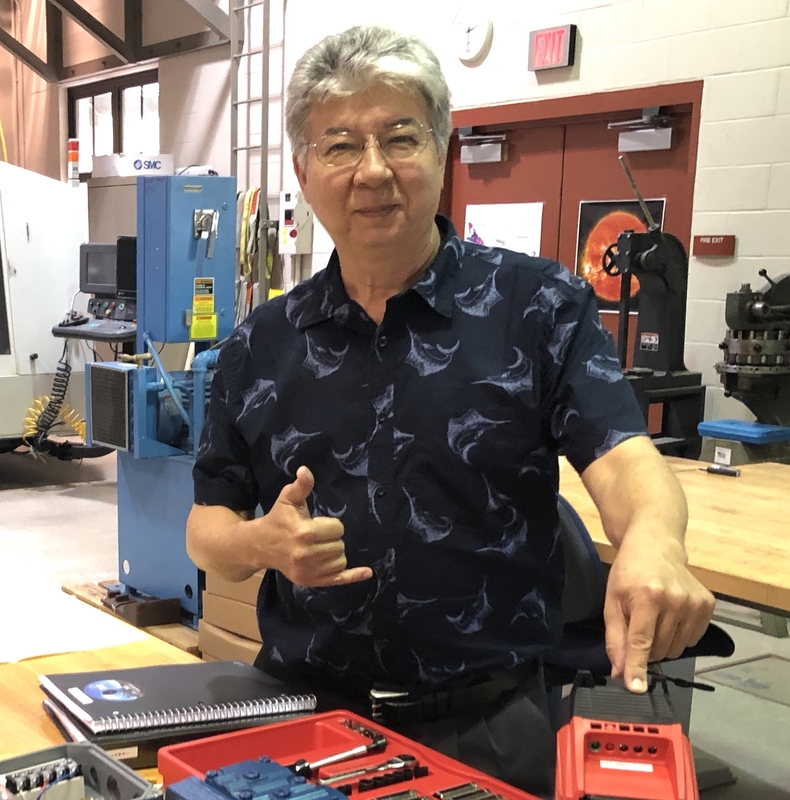 He volunteers as a mentor for the FIRST (For Inspiration and Recognition in Science and Technology) Robotics team (Hilo Viking Robotics 1378) at Hilo High School, where he teaches theories and application of machining and welding to high school students. His team placed 2nd at the Hawaii Regional Competition this March 2018 and qualified by earning the Engineering Inspiration Award. In his free time, he enjoys archery, astronomy, and free diving. The UH 2.2m Telescope (“UH88”) was constructed in 1968 and saw first light in 1970. One of the main mechanisms of the telescope are the two dome shutter doors. Each door weighs 22,000 pounds, together they weigh 44,000 pounds. These doors are controlled by four synchronous AC motors which open and close them remotely during telescope operations at night. The operator has no knowledge of the velocity or position of the shutter doors except for end-of-travel, when the doors make contact with the limit switch. The limit switches are mounted in eight locations on the shutter opening (one on each corner of each door). When a door contacts a limit it disconnects signal to a contactor, which shuts power to both motors on that door. The shutter door motors are 50- plus years old and Institute for Astronomy (IFA) needs to upgrade the motor drive system to newer technology. The main upgrade is to replace all four of the current synchronous AC motors with variable frequency drive (VFD) motors. My project is to design and fabricate a test cell to run one of the new VFD motors which will be controlled by a variable frequency controller (VFC). I designed and fabricated a test cell that is both portable and flexible. Since a VFD motor weighs 38 pounds, I had fabricate the test cell in two pieces. One is the plate to mount the motor, and the other unit is a stand to mount the controller. With the new controller, the operator can monitor the parameters of the new motors, such as amperage, power, frequency, and torque values via computer networking. This is an invaluable method of testing and programming the new motors utilizing the portable test cell that I designed and fabricated during my internship with IFA. IFA will utilize the data collected for analysis of replacing the four motors and also for training.